Our opiate epidemic is a community problem requiring community solutions. According to the Substance Abuse and Mental Health Services Administration (SAMSHA), four out of five heroin users first began with recreational use of prescription pain relievers. The National Institute on Drug Abuse (NIDA) cites that nearly 50 percent of young people who inject heroin started by abusing prescription drugs. This data helps to illustrate that it is a slippery slope which often begins with the abuse of prescription drugs and leads to heroin addiction. As a community, our weapons of choice are increased education, prevention and enhanced treatment in order to attack, and ultimately defeat this epidemic. In 2016, there were 312 deaths due to accidental drug overdoses (compared with 60 accidental overdose deaths in 2013). 15.6% of Summit County high school students reported using a prescription drug without a doctor’s prescription one or more times during their life (2014 YRBS data). In 2017, an average of nine people per day are seen in local hospital emergency rooms for overdoses. Summit County Public Health provides ongoing monitoring of drug overdoses and provides a real-time, searchable database called the Drug Overdose Emergency Department Visit Dashboard. The Summit County Opiate Task Force has implemented several initiatives in fighting the opiate epidemic. See what the opiate task force is doing to reduce opiate / heroin use in Summit County. Each of us can and must play a role in this fight. 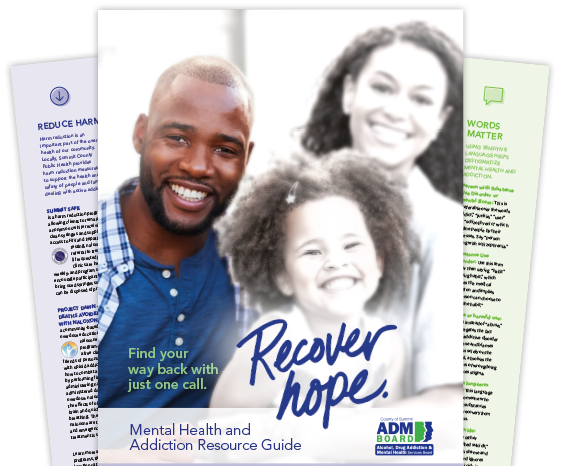 When much of the attention of our community is on the impact of the epidemic, it is just as important to focus on the fact that people can and do recover. These three brief videos show Summit County residents sharing their recovery journey: Marsha, Joe and Jerod. The rate of positive workplace drug tests has increased for the fourth straight year, reaching the highest level in 12 years. Working Partners provides drug-free workplace programs, products, policies, and procedures to increase workplace safety. Read more about the problem of drug abuse in the workplace and what can be done to establish and operate a comprehensive drug free workplace. Choosing a Drug Test - This video gives tips to employers on choosing a drug test. The Substance Abuse and Mental Health Services Administration (SAMHSA) provides comprehensive programs that address illicit drug use. Employers can get resources on maintaining a drug-free workplace including a toolkit to implement policies and programs. Employers can take a proactive role on opioids in the workplace. These tools will help employers partner with benefit providers and help employees understand opioids.